Wing span: 1 1/2 - 1 3/4 inches (3.7 - 4.3 cm). Identification: Upperside is gray with cream-colored patches across both wings; forewing has 2 black spots. Underside is similar but lighter. Essentially identical to Riding's Satyr. Life history: Males perch and patrol in grassy flats and slopes near the bottoms of prairie hills to seek females. Life history not reported. Flight: One flight from mid-August to late September. Caterpillar hosts: Wheatgrasses, possibly other grasses. Adult food: Rabbitbrush and likely other flowers. Habitat: Short-grass prairie, and grasslands with some areas of bare soil. Range: Southern Montana south through Wyoming to northern Colorado. Also central Utah. 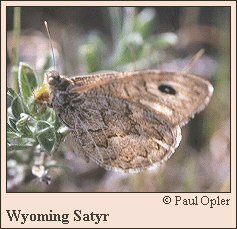 Comment: Although identical to Ridings' Satyr, this butterfly flies too soon after Ridings' Satyr's flight to be its offspring. Also the fact of its differing mate location behavior and possible host difference support its likely reproductive isolation and recognition as a separate species. Conservation: All known populations should be monitored. Most are cattle range not threatened in any way. Most likely, after its range is investigated it rank may be lowered to G4 or G5. The Nature Conservancy Global Rank: G3G4 - Very rare or local throughout its range or found locally in a restricted range OR Apparently secure globally, though it might be quite rare in parts of its range, especially at the periphery. Scott, J.A. 1998. New western North American butterflies. Papilio, new series.